According to the latest International Monetary Fund forecasts, Ethiopia’s growth is expected to stay high in 2017/18, at 8.5%, supported by continued recovery from droughts and export expansion as new manufacturing facilities and infrastructure come online. The IMF Executive Board concluded the Article IV consultation with Ethiopia on 12th January, reporting that Ethiopia has recorded annual average GDP growth of about 10% in the last decade, driven by public investments in agriculture and infrastructure. The poverty rate fell from 44% in 2000 to 23.5% in 2015/16 when GDP growth was estimated at 9%, as agriculture rebounded from severe drought conditions. Industrial activity expanded, with continued investments in infrastructure and manufacturing. FDI growth was 27.6% due to investments in the new industrial parks and privatisation inflows. Over the medium term, growth is expected to remain around 8%, supported by sustained expansion in exports and investment. The authorities’ policies under the second Growth and Transformation Plan (GTP II) are expected to underpin domestic private sector development and FDI. GTP II also envisages allocating significant resources to poverty alleviation and the social safety-net, while efforts to strengthen financial inclusion are underway. According to the latest World Bank Global Economic Prospects report, Ethiopia’s economy is forecast to grow at 8.2% in 2018, maintaining its position as East Africa’s fastest growing economy. 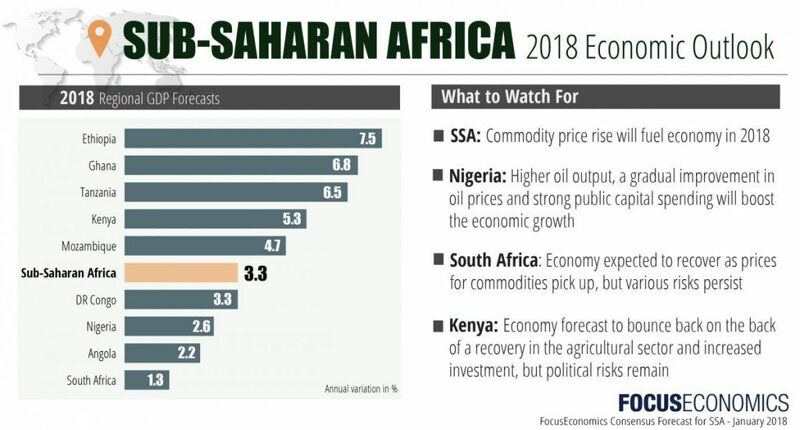 The report also notes that six of ten economies forecast to grow the most in 2018 are in Africa, with Ghana taking the lead, closely followed by Ethiopia. The full report can be accessed at http://bit.ly/WBGEP. 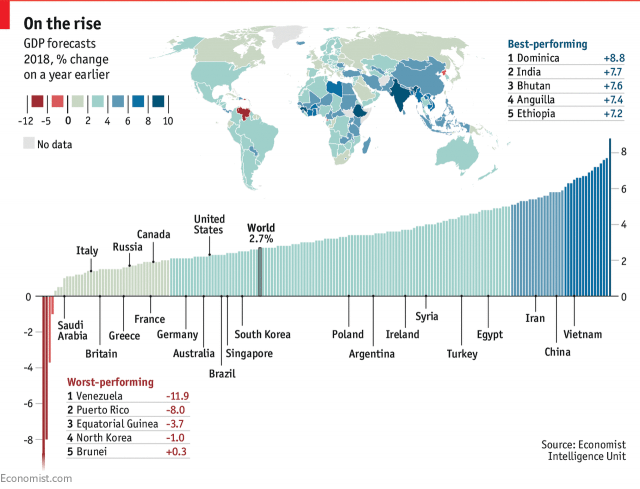 The latest Economist Intelligence Unit forecasts that Ethiopia is among the world’s fastest growing economies in 2018, and its GDP is expected to increase by 7.2% this year, against the rest of the world’s 2.7%. Focus Economics says Ethiopia is projected to be Africa’s top performer in 2018, growing by 7.5%, against the rest of the region’s 3.3%. Ethiopia is among 17 economies that will grow faster than China in terms of Purchasing Power Parity (PPP) in 2018, says PricewaterhouseCoopers (PwC) Global Economy Watch. The other countries include India, Ghana, and the Philippines. 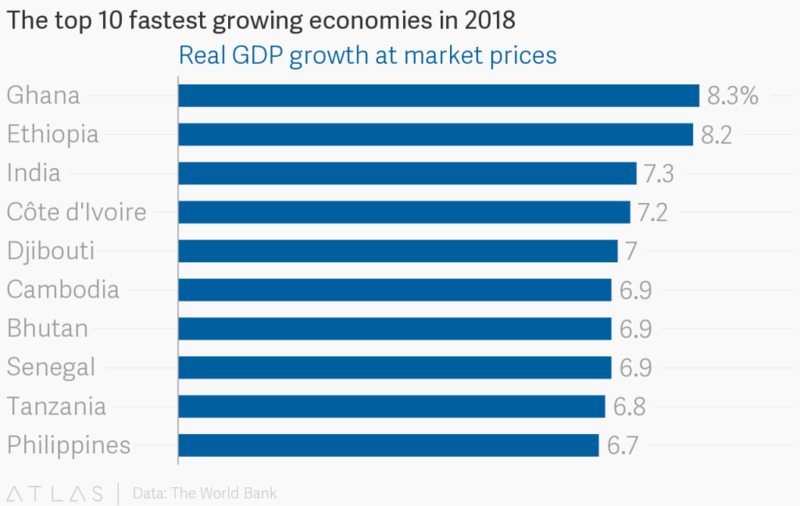 Eight of the ten fastest growing countries in 2018 could be in Africa. China, the world’s largest economy in PPP terms, could grow by 6-7% in 2018, slower than previously, but in line with expectations. The global economy is set to grow by almost 4%.